Tucked away in a beautiful volcanic caldera south of Bend is a sparkling blue alpine lake with hot springs along its shore, known as Paulina Hot Springs. These hot springs are located about 36 miles south of Bend. Paulina Lake is accessible during the winter via snowmobile or cross-country skis. Surrounded by the Deschutes National Forest, you can enjoy hiking and camping when you visit the hot springs. Bring a shovel to uncover these hot springs hidden below the rocks on the shore. Several miles south of Bend in the scenic Newberry Crater lay two pristine lakes. The larger lake, Paulina, is not only known for fantastic fishing, but for its natural hot springs as well. Paulina Hot Springs often seem a bit elusive to those who try to find them. Found primarily along the lake’s northeastern edge, these hot springs are actually located underneath the rocks along the shore. Be sure to bring a shovel to expose the springs. The spring water can reach up to 126 degrees, so cool it down with a bucket of cold lake water. Hiking up to this beautiful lake and springs on a warm summer day makes for a great family outing. To get to Paulina Hot Springs from Bend, take Hwy 97 south, then head east on Paulina / East Lake Road and follow the signs to the lake. Total distance from Bend is about 36 miles. The roads are closed when there’s snow, so winter lake access requires either cross-country skis or a snowmobile. Fishing – Paulina Lake is a great place to fish, particularly for trout and Kokanee salmon. In 1993 a 27 pound 13 ounce brown trout was caught, which is the record to date. Hiking and horseback riding – There are over 100 miles of trails near the lake to explore on foot or via horseback. 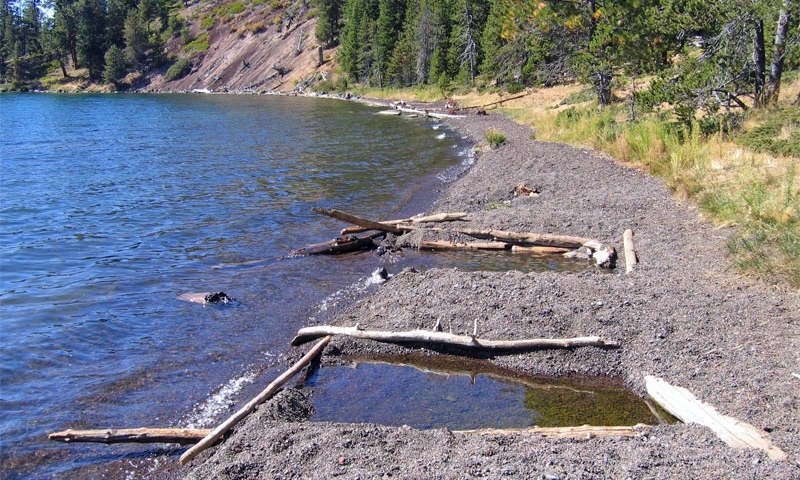 Camping – Bring your tent and gear when you visit this lake nestled in the beautiful Deschutes National Forest, as there are several campgrounds nearby. Cross country skiing and snowmobiling – With over 500 inches of snow each year, the Newberry Crater is winter paradise. Paulina Hot Springs have varying temperatures, typically ranging from 96 to 113 degrees, but springs further from the lake can reach 126 degrees. Parts of Paulina Lake reach a depth of 250 feet. Paulina Lake covers 1,531 acres, and reaches depths of 250 feet. The proper pronunciation of Paulina is “Pull-line-ah”. Natural hot springs in the McCall Idaho area.